On 31 August, a delegation from the University of Hertfordshire (UH), UK, comprising Stuart Smith, Head of International Affairs; Ave Vinick, Director of Development; and James Perrin, Regional Manager, Africa and Middle East, accompanied by Moyo Jolaoso, Former Director, Agriculture and Agro-allied Dept. of Nigeria Raw Materials Research and Development Council and Olusola Kayode, Consultant and Former Representative of Nigeria to UNIDO-France, visited the IITA-Abuja Station. James Perrin, Regional Manager, Africa, and the Middle East receive a gift from IYA member, Adetola Oladini. The visit aimed to explore possible areas of collaboration and partnership. The delegation held discussions with the Station Management met with representatives of the Agripreneurs and were led on a conducted tour of the Yam Tissue Culture facility. The delegation said they were impressed with ongoing programs and initiatives, particularly the IYA initiative. Receiving the delegation, Gbassey Tarawali, Head, IITA Abuja Station, apprised them about IITA and the strategic role the institution has played in the past 50 years, working with partners to help resource-poor farmers increase agricultural productivity. He talked about the IITA mandate crops including biofortification and the research hubs in West, Southern, East, and Central Africa. He also stressed Abuja Station’s vital role in showcasing IITA’s technologies to donors, embassies, development partners, and government agencies within Nigeria and beyond. Tarawali further explained about the efforts being made by IITA in addressing youth unemployment challenges in Africa. He also stressed the importance of collaboration in upscaling the IITA Youth in Agribusiness model and using it as a vehicle for addressing youth unemployment in Africa. He mentioned that the model is currently being used in a youth program implemented in Nigeria and many other African countries. Corroborating Tarawali’s statements, Richardson Okechukwu, Cassava Commodity Specialist and Officer-in-Charge of IITA-Onne Station, explained the importance of partnership to research and development in finding solutions to the problem of food and nutrition security. He gave a historical perspective on IITA’s role in training postgraduate research students from across Africa. He pointed to available opportunities for partnership in research, breeding, yield and quality improvement, market linkages, extension, mechanization, livelihoods and resilience, food safety, and biofortification. He also emphasized the challenges of developing locally and environmentally adaptable motorized tools and machines that are portable, affordable, gender friendly, and available for the poor. On the visitors’ part, Perrin appreciated IITA on behalf of the team and thanked the Abuja Station management for the warm reception while expressing deep satisfaction with the work that IITA is doing especially in exploring options for attaining employment creation for youth across Africa. He mentioned a similar concern that had been raised about youth unemployment challenges during their earlier meeting with the Hon. Minister of Agriculture and Rural Development, Chief Audu Ogbeh. He said that from the discussions he sees several areas for a potential partnership with IITA. These include training and support to education whereby UH can support research students by funding a percentage of their research costs and offering internship and exchange program opportunities; development of a pathway program that will enable students to commence research at IITA and transfer to UH for agricultural education programs; and UH sponsorship of research geared towards finding solutions to agricultural mechanization challenges. He, therefore, proposed a MoU on mutual areas of interest and partnership between the two institutions as a first step. 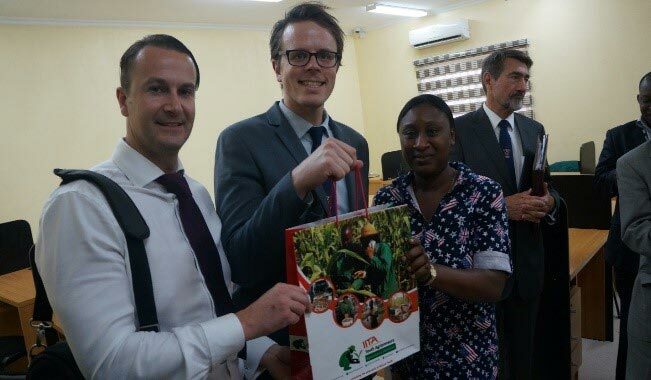 The visitors presented a gift to IITA Management, which was received by Tarawali on their behalf. In return, members of the Abuja youth also gave a presentation to the delegation, which was highly appreciated.